Texas alternates election years with governing years, with legislative sessions set in the odd-numbered years after voters choose their leaders. There are variations, but it’s got a rhythm: Choose them, watch them govern, choose, watch. The elections behind us, it’s time to see what this particular bunch will do. Texas alternates election years with governing years, with legislative sessions set in the odd-numbered years after voters choose their leaders. There are variations, but it’s got a rhythm to it: Choose them, watch them govern, choose, watch. The elections are behind us (and ahead), and it’s time to see what this particular bunch will do in office. 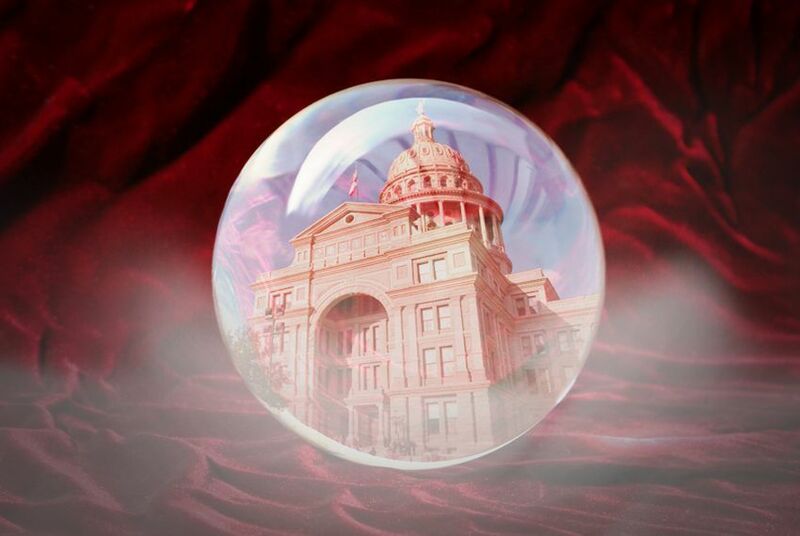 Will the legislative session starting Jan. 11 really be all that different? Most soothsayers and gray-hairs in Austin think it’s going to be a bloody mess. If this were an ancient mariner’s map, it would have scary drawings around the treacherous state budget, the fearsome beastie called redistricting and the dangerous marshes of voter ID, border control and anchor babies. States’ rights and the 10th Amendment would be over in Uncharted Territory. But they’ll be gone by June, right? Right? The Texas Legislature meets every two years, for no longer than 140 days. It can also meet any other time — usually at the behest of the governor — to consider emergency legislation or unfinished business or, really, anything. Redistricting and the budget are often the triggers. In 2003, when congressional redistricting was last confronted, lawmakers came back in late June and stayed into August, then came back again a few weeks later in September. In 1991, when redistricting and a budget crisis were served up, lawmakers returned in August for the first of several special sessions. Why is everyone in Texas politics already talking about 2012? Gov. Rick Perry says he’s not running for president, and he’s been saying it to audiences all over the country on his recent book tour. He is becoming a national figure — talk amongst yourselves about what he’s up to. That’s what lawmakers are doing, as are state Republican officeholders who like the people at the top but wish they would move and create some opportunities for others. The guessing game over Sen. Kay Bailey Hutchison’s plans are under way again, mulling the possibility of a plum job opening. This national stuff happened before, when George W. Bush was preparing a run for president. Then, as now, speculation colors a legislative session. Republicans took Congress. Texas has more Republicans than Democrats in Congress. Discuss. Texas dealt itself out of power when, in 2003, legislators approved a congressional redistricting plan that knocked off a handful of Democrats who had — whatever your opinion of their political hue — significant seniority in Congress. But now it’s a Republican Congress, and some Texans are senior enough to be in positions of power. Top that with new census numbers that will add four members to the delegation after the 2012 elections, and it’s a power surge. Republicans won. Why are they bickering so much now that they’re in control? With Texas effectively a one-party state, the action is in the big red tent. The thing about a big tent is that it’s got plenty of room for factions. The Republican Party in Texas is split: Go back and look at the primaries or at the internecine race for House speaker that’s currently underway. The party has 101 members in the 150-member House, 19 in the 31-member Senate and 23 in the 32-member congressional delegation. But on many issues, they’re divided. What’s the fun of having a supermajority if you can’t get along? Are Texas Democrats ready for hospice care? Do they have enough people to be a force during the session? Do the Democrats even want to be a force in a session that involves bloody budget cuts and other rotten choices? And can they have enough impact on redistricting maps to prevent Republicans from locking them out of a majority for the next decade? They’ll have to stick together and wait to see whether the Republicans stay divided and need help passing bills. What’s next for the Tea Party? We know they’re loud during elections. So? Is this a movement that gets co-opted by groups like the new legislative Tea Party Caucus, effectively a subset of the Republican Caucus? Is this just another angry mob that goes home when the economy recovers? Phase one was a success —now we know who they are. The question in 2011 is, what will they do now that they have our attention?